« Hats to the Rescue! There is something about a simple, beautiful design, paired with super soft and brilliantly coloured yarn that really turns me into a copycat knitter. It’s like I see the knit wear and I can’t think of anything else until I’ve cast it on! 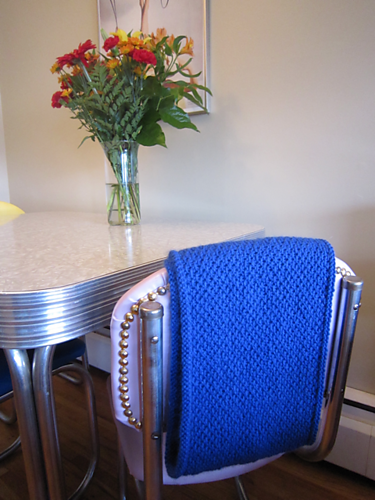 Meet the Honey Cowl. KT (a knitting machine with excellent taste we’ve come to know and love on Friday nights. You can check her out on her chic blog here) brought in this stunning cowl and I spent most of last Friday night feeling the soft soft yarn and thinking about all the colours I would knit this same cowl in. I briefly entertained the idea of absconding with the brilliant blue knit, but immediately dismissed the idea as a karmic no no. The thing about this cowl is that the already nice yarn was even nicer once it was knit up. Is this possible? It was as if the pattern/yarn combination was equal to more than the sum of its parts. Strange knitting voodoo. Hmmm, just read back over this and it seems a bit gushy and obsessive but that’s just how I feel about this cowl. KT knit hers up in the Aslan Trends Royal Alpaca, 2 skeins, but it’s a cowl so you could really knit it up in almost any yarn. If you wanted a chunky version you could just take out some stitches or give your cowl and extra wrap. The possibilities are pretty much endless. I do, however, recommend a yarn with good stitch definition, like the Aslan Trends, to show off the pretty stitch pattern. This entry was posted on Tuesday, November 16th, 2010 at 9:50 am	and is filed under Uncategorized. You can follow any responses to this entry through the RSS 2.0 feed. Both comments and pings are currently closed. What is it with knitters and being so protective over their projects? Why be afraid of knitting up the same pattern in the same color? I would take it as a compliment and be really happy. Isnt that one of the great things about knitting? That we are making the same knots that have been made for hundreds of years by people all around the world to create something functional and beautiful. So why not share the love when a great pattern / yarn / color combination is found amongst friends? Hmm, I see what your saying. It’s not that I’m afraid to be a copycat (obviously) it’s just that knitting something unique is one of the cool things about knitting. I certainly don’t feel bad about copycatting, nor do I care when people wanna knit things just like me; you’re right, it’s totally a compliment. I’m just glad KT feels the same way! Perhaps I should take more joy in the process and forget about who knit what in what colour. I am allready on my second honey cowl in the original Madelintosh DK, first in light green (grasshopper) and now in beautifull cabernet-burgundy-merlot color called tart! try it in this yarn, its a cozy joy, love it………….. 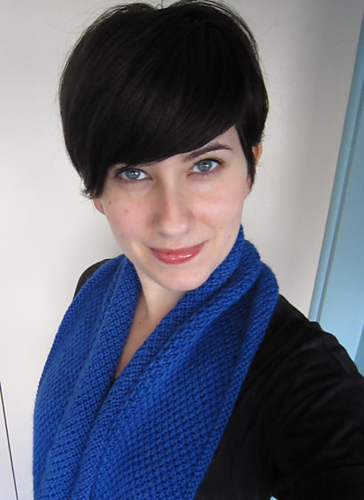 I would be flattered if a ton of people starting making this cowl in the same yarn! Chances are that we wouldn’t all the in same place at the same anyway.